A talented climber and guide, Eric is a 35 year resident of the Pacific Northwest. A former competitive distance runner, and cyclist, Eric was born in Alaska and introduced to the wilderness at an early age. He has led many of our mountaineering courses in the Cascades. He has been climbing for over 25 years, and has guided trips for 16 years. 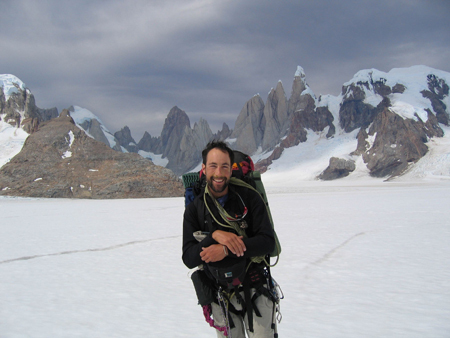 Eric has vast experience in the mountain ranges of the Cascades, Rockies, Andes and Himalaya. He has led or participated in over 30 expeditions to Alaska, Canada, Kenya, Tanzania, Antarctica, Nepal, Tibet, Peru, Bolivia, Argentina, and Chile. His background covers technical ice, rock, and high altitude. Over the last 15 years, he has developed climbing curriculums for local organizations. Eric has guided for us in the Cascades, on Denali, Mount Vinson, Cho Oyu, Everest/Lhotse, Aconcagua and Kilimanjaro for the past 15 years. Most recently, Eric guided for us on Mt. Rainier, Kilimanjaro, Everest/Lhotse, Denali and has been helping future Everest climbers with training and consultation. Eric has led large fundraising teams and film projects on Kilimanjaro, including the 2008 film documentary – The Mountain Within. Eric is the most experienced Western guide working on Kilimanjaro, having led more than 100 trips on that mountain, spending significant time with the local Chagga peoples native to the lower slopes of Kilimanjaro. Eric has led Other passions include ski mountaineering, distance trail running, ocean sailing, and winemaking. From 2006 until 2015 Eric was a founding member, partner and winemaker for Ott & Murphy wines, located on Whidbey Island, Washington State. When not guiding, Eric can be found near home with his wife Melissa and young son Conner in Bellingham, Washington. Eric is excited about family travel and introducing Conner the mountains and cultures of the world.